The office of governor is the only public office Ross Barnett ever held and the only political office for which he ever campaigned. He is also one of only two Mississippians who ran for the office four times. He ran and lost in 1951 and 1955, he was elected in 1959, and he ran again unsuccessfully in 1967. Born at Standing Pine in Leake County on 22 January 1898 (the last Mississippi governor born in the nineteenth century), Barnett graduated from Mississippi College in 1922 before earning a law degree from the University of Mississippi in 1926 and opening a law practice in Jackson. He went on to become one of Mississippi’s most successful trial lawyers. During Barnett’s administration the state of Mississippi was celebrating the centennial of the Civil War. It was also responding to the great changes brought on by the civil rights movement. Barnett, who made his first speech as governor-elect at a Citizens’ Council meeting, vowed to maintain segregation in the state’s public schools, even pledging to go to jail before he would allow any integration. 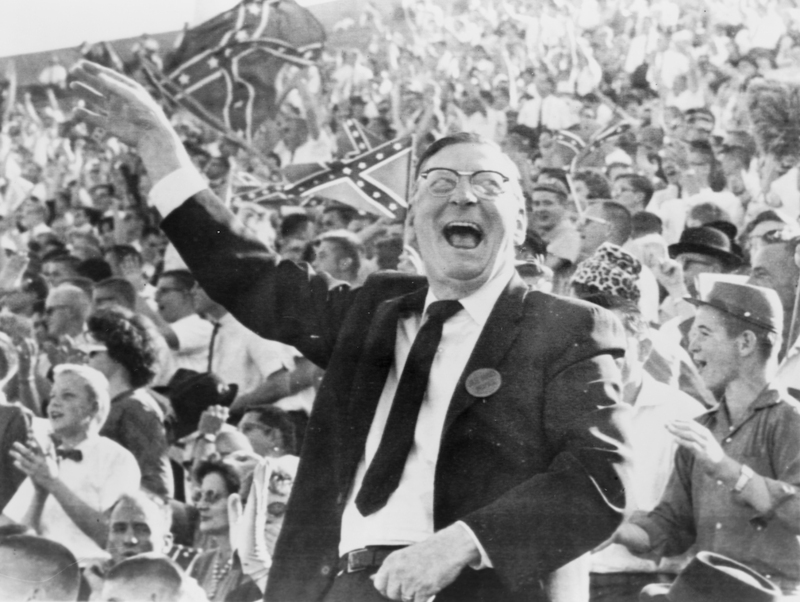 In announcing his candidacy in 1959, Barnett had said, “I am a vigorous segregationist. I will work to maintain our heritage, our customs, constitutional government, rights of the states, segregation of the races, and industrial and agricultural development.” Barnett spoke widely inside and outside Mississippi on his support for state control on issues of education and voting. In 1962 the US Supreme Court directed the University of Mississippi to admit African American James H. Meredith. Barnett took numerous steps to slow or directly oppose Meredith’s admission and condemned John F. Kennedy’s presidential administration, vowing to never “surrender to the evil and illegal forces of tyranny.” Opponents of the university’s integration clashed violently with federal troops, leading to the deaths of two people on the night of 30 September 1962. Nevertheless, Meredith ultimately enrolled, the first step in the eventual elimination of state-sponsored racial segregation in Mississippi’s public schools and universities. Several significant economic developments also occurred during Barnett’s administration. A series of amendments to the worker’s compensation law and the enactment of a right-to-work law made Mississippi more attractive to outside industry, and more than forty thousand new jobs were created during his four years in office. Barnett’s industrial development program also included the construction of industrial parks throughout the state and the establishment of the Youth Affairs Department under the Agricultural and Industrial Board. His administration made it easier for localities to use industrial revenue boards to attract new business, and he was especially proud of persuading Standard Oil to locate refining operations on the Gulf Coast. Barnett resumed his law practice after leaving office in 1964 but continued an active interest in state politics. In 1967 he ran for governor but was eliminated in the first primary. He was one of Mississippi’s last popular stump speakers and remained a favorite at the Neshoba County Fair until his death on 6 November 1987. While a reservoir in Hinds County and a lake in Smith County bear his name, he is most remembered for his role in the unsuccessful resistance to the desegregation of the University of Mississippi.